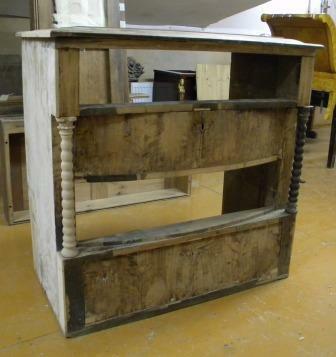 We often meet clients which have faced a problem of poor-quality work or a situation when money have been paid, but furniture restoration as that hasn’t been spent. Therefore before to bring a product for restoration, we advise to familiarize with examples of the spent restoration works of experts of this or that workshop. Unfortunately at present the main argument for the customer is low final cost of carried out works which makes a reservation, and finally it appears that works have been spent not completely, i.e. only “cosmetic” repair of a product has been made. On this illustration the commode which is subject to restoration which has visited various workshops is presented. For a recovery work the client had been brought advance payment, and works haven’t made. Finally the furniture has appeared in our workshop. 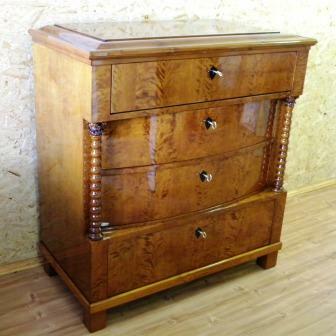 Now restoration process is finished also a commode has taken the primary form.